Cayenne pepper consists of ground red chili flakes, and is unrelated to black pepper. The hot spice contains the key ingredient capsaicin that delivers the heat in cayenne pepper. The spice originated in South and Central America thousands of year ago. Today, the spice provides a variety of nutritional and health benefits. Learn how to use cayenne pepper when cooking and at mealtime. Keep a shaker of cayenne pepper at your dinner table. Sprinkle cayenne on seafood such as oysters, lobsters, shrimp and fish. Add a dash of cayenne to hot soups and stews. Replace salt with cayenne with flavoring your food for a low-sodium alternative. Place a pinch of cayenne into your hot chocolate for a spicy flavor. Hot chocolate with cayenne pepper is generally enjoyed in Latin American countries. Stir in a small amount of cinnamon or stir the hot chocolate with a cinnamon stick to compliment the cayenne pepper. Add cayenne pepper to eggs dishes such as breakfast souffles, omelets and even egg salad. Cayenne pepper can also be sprinkled over tomatoes and other fresh vegetables when making a salad. Include the ingredient in your meat marinades, especially for poultry and fish dishes. Spice up hummus, guacamole and other dips with cayenne. Increase the amount of cayenne pepper in your recipes gradually. Your palette must get used to the spice, and that doesn't happen over night. Slowly increase the amount of cayenne pepper in your diet to get used to the hot and spicy flavor. Store the ingredient in a cool, dark place. The spice loose its flavor quickly. Only store small amounts you are able to use. Cayenne pepper has a variety of nutritional benefits. The spice decreases blood clotting. 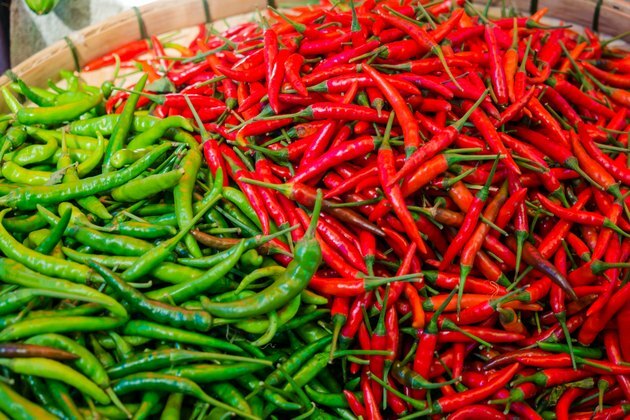 The cultures where cayenne pepper is heavily consumed heart disease occurs much less. Vitamins A, C and B6 are found in large amounts in the spice. According to the University of Maryland Medical Center, pregnant woman can include the spice in their foods, but should not take a cayenne pepper supplement. However, if you are nursing, cayenne pepper is not recommended as it will pass through the breast milk. Cayenne pepper is too spicy for infants.